Easton First Teamarrow-rightCreated with Sketch. After last weeks wind related call off we were back on the road this weekend with a first ever visit to Kirkley and Pakefield. We were without the services of Jahi, Aggy, Wheeler and Beanie for various reasons but were able to welcome back Spikes, Raffa and Sags to the squad for our longest away day of the season. Having beaten the hosts 2-0 in the reverse fixture there was some surprise to see that only one player remained for the opposition from that day. They had gotten swift revenge after that game though as were were dumped out of the league cup by them a few weeks later. Kicking off into the wind and up the slope we were dealt a blow in the first 10 minutes as Matty Fell make an awkward landing from a slide tackle and dislocate his left shoulder before heading straight to the hospital for treatment. Sags was introduced from the bench and a back line reshuffle was done to plug the gap. This didn't knock us from our stride however and just five minutes later Lewi stepped out of the Easton back line and robbed a Kirkley player before striding forwards and used the conditions to curl a superb effort that squeezed between keeper and post to make it 1-0. Lewi was in the game again 10 minutes later as his perfectly flighted ball found George through 1v1 with the keeper and he made no mistake finding the far corner to end his goal drought in style. Kirkley were struggling to get a foothold in the game at all and despite winning a couple of free kicks in dangerous positions Baz wasn't forced into action as the half wore on. Rob did however have to be alert as he made a good block tackle on the edge of the Easton box to keep the score at two nil. With 35 mins on the clock good pressure on the left from Mawford saw the home right back leave a back pass short for his keeper and after Mawford drove towards goal he unselfishly squared to Cissell who rolled into an open goal to make it 3-0 and give the hosts a mountain to climb before HT. Kirkley had their best spell of the game in the opening 5-10 minutes of the second half as they went in search of a way back into the game but despite having the ball in good areas they looked somewhat toothless when they got into a threatening positions. We were guilty of stepping off a little out of posession and the wind was playing havoc as we looked to get on the front foot. 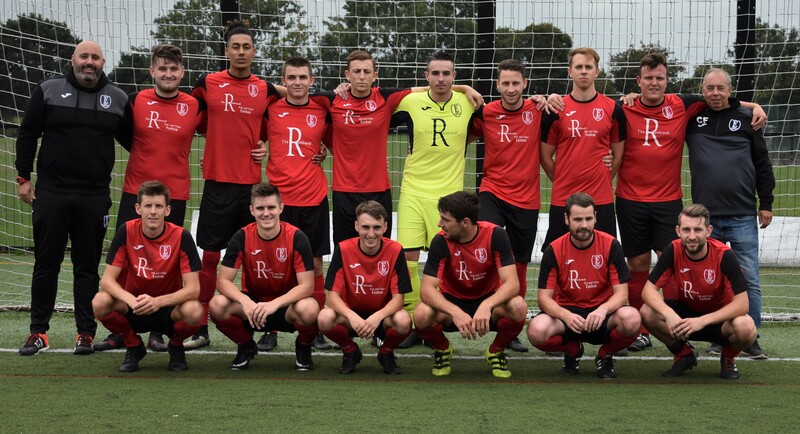 With 15 minutes of the second half gone Spikes and Raffa were introduced from the bench with Rob and Ian making way and the latter was immediately involved in the game as he broke forwards from midfield before finding Cissell who fired home for his fifth goal in as many games. Kirkley were starting to open up now and George couldn't find Mawford for a tap in when he was well placed before both Cissell and George both saw efforts clear the bar. Raffa was however involved again as Hayden grabbed the goal his man of the match performance deserved. Some neat passing saw us get to the edge of the Kirkley box before a sweet left footed volley from the Easton midfielder whistled past a static keeper into the corner of the net for 5-0 with 15 minutes to play. The scoring was wrapped up five minutes later as Raffa again got away from the Kirkley back line before playing the ball across the 6 yard box only for Cissell to step over the ball leaving George to fire home for his second of the day. A really good display from all involved and in truth the scoreline could have been heavier. 12 goals scored in the last two games now as we look to have a strong finish to our first ever season in senior football.